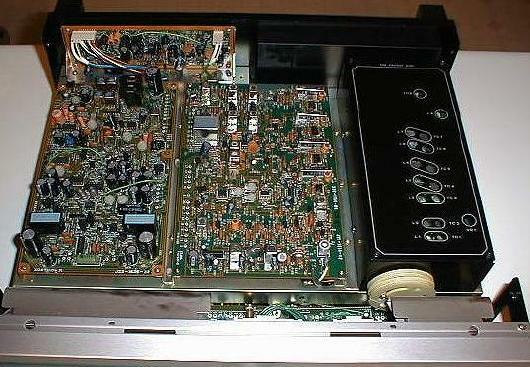 Our contributor David Rich observes that like the McIntosh MR 78, which is "double-tuned at the input, then has a cascoded (better linearity) RF stage followed by another double-tuned filter, the KT-917 is the same except the drain - source connection of the cascode is double-tuned and the output of the cascode amp is triple-tuned. The oscillator gets an extra tuned stage to reduce phase noise and improve matching. The mixer is passive to keep the good IP3 [third-order intermodulation - Editor] rejection. The KT-917's Stereo MPX circuit is a zero-order sample-and-hold. A small pulse generated by an analog circuit turns on the MOSFET switch for a very short period of time. At that time the output follows the composite. For the rest of the time the output stays stable. This is not a switching system where the polarity of the composite is switched on 50% of the time (the older Kenwoods do that). The zero-order sample-and-hold can be done with diode networks alone and it shows up in even early tuners such as the Marantz 10B I think. It is all explained in the KT-917's manual. IC 9 is the switch (TC4066), C35 and C38 are the hold caps, and the op-amp after that is a TL 072 (IC 10). It has to be a FET op-amp to hold the charge on the cap. IC1, IC5 and IC 12 are also upgrade candidates as are all the passive in the signal path except C35 and C38 which I would not touch. IC 10 needs high slew rate and fast settling time like all op-amps in a sample-and-hold application. See Linear Tech for an upgrade of the TC 4066 (this is a high-risk move but may offer lower charge injection. 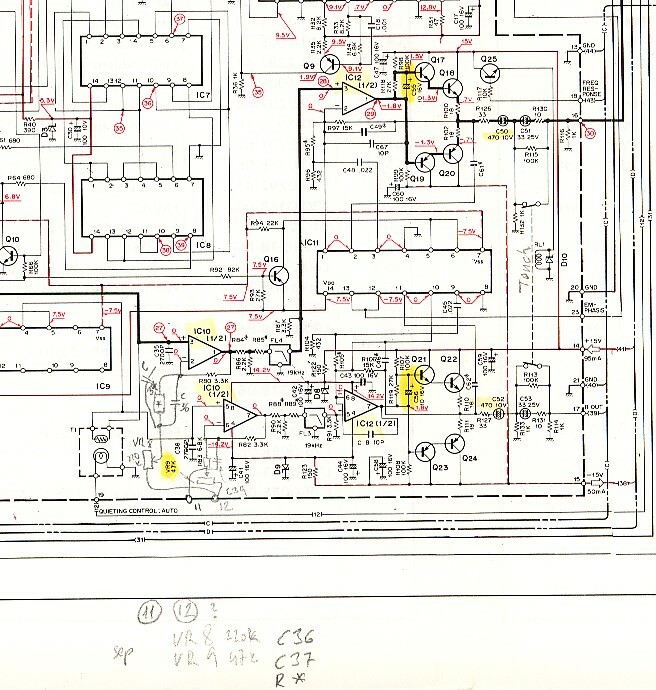 It should only be done if you really understand the circuit and how a part change in the switch could really kill its operation. 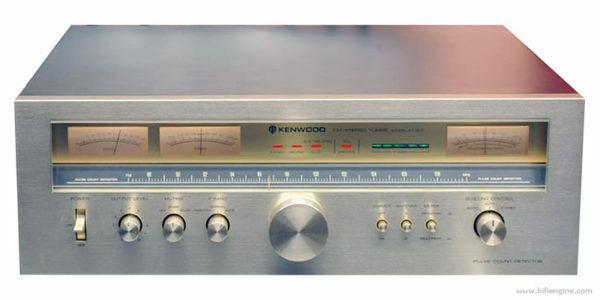 Remember that Kenwood dumped the timing circuit to the switch in the next-generation tuner. 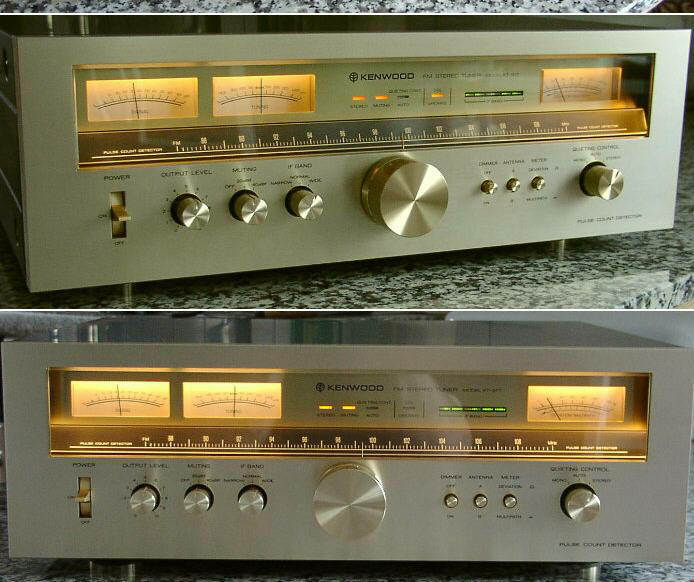 The last Kenwoods used analog multipliers." Our contributor Georges tells us that the KT-917 has "two RF amplifier transistors Q1 and Q2 (Q2 being a common gate amplifier) before the diode doubly balanced mixer." 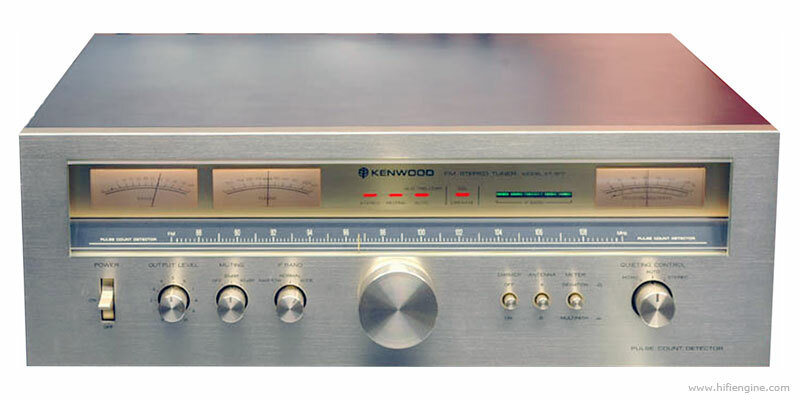 And the KT-917's service manual says, "The RF amplifier section has a wide-gap, 9-gang variable capacitor for the double-double-triple tuning system (one tuning stage for ANT, and two tuning stages for RF). The CC3588DE used as Q1 is a DD-MOS FET (selected SD-306) which features low noise and superior square response over a broad input level/frequency range. It also features a high power gain. VR1 adjusts Q1's input response to its maximum linearity. For servicing adjust VR1 so that the maximum deflection of the S-meter can be obtained. In the second stage, another double-tuning circuit is coupled to a common-gate amplifier, which features a lower input impedance and stable amplification with no influence from feedback admittance." This should, we think, be enough to be getting on with. Do grounding boxes improve sound?